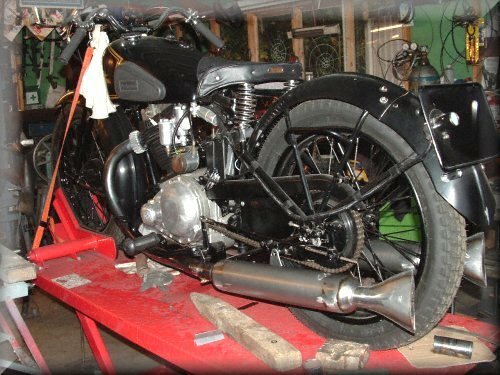 New Imperial 1936 shown here with new handmade headers test fitted and the fish tail silencer parts yet to be assembled. 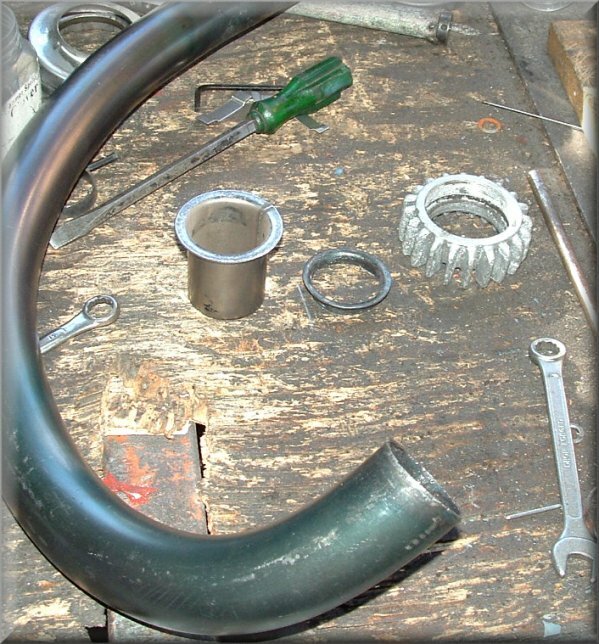 This photo shows one of the headers with all the curves in the right places and the port flange formed. Here a fish tail is being formed in the press. 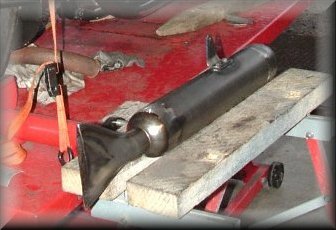 The ram presses the former through the top to size that end to fit over the right sized tube at the exit of the silencer. Fish Tails do serve an acoustic purpose. They are quieter than a round hole exit of the same area. Sound waves are round and passing them through a slot forces them to beak into a number small round waves. apparently, a number of small waves have slightly different frequencies which interfer with each other causing more 'white noise' - which is (or seems) quieter. Do fish tails serve any purpose other than cosmetic? 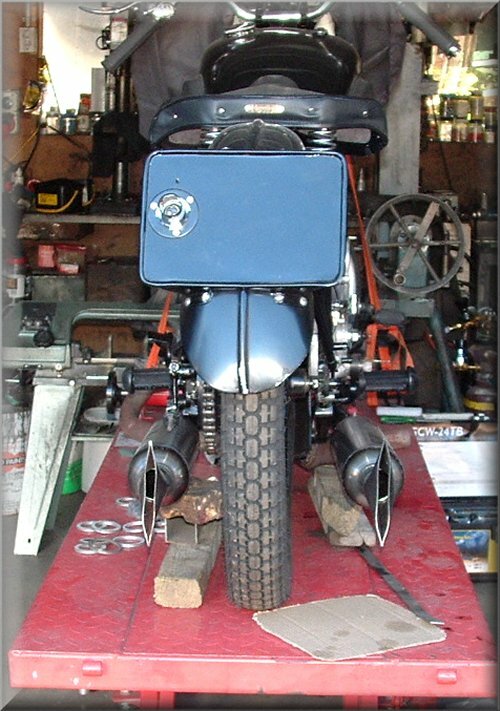 DIY fitting guide for handbent headers on some vintage bikes. Size by carefully hand- filing, machine sanding or lathing using the flange, and port size, as a guide. 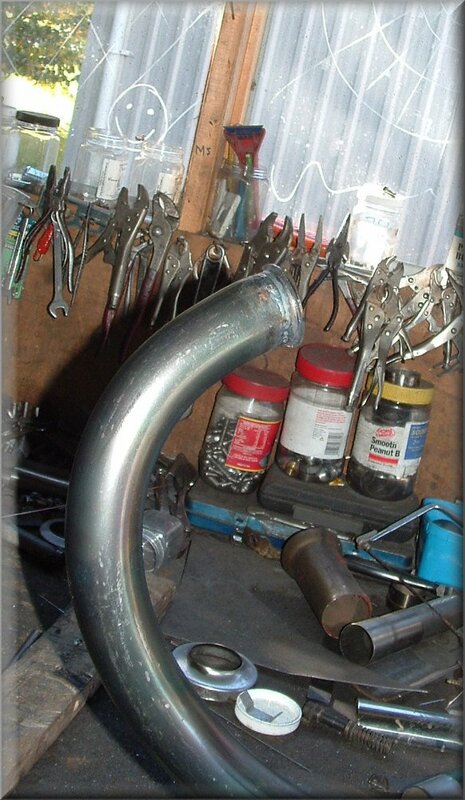 Try this method of forming a flared length of tube then trimming it to size and welding it on as it is easy for someone with minimal skills. Cut the collar leaving a 10mm stub as shown below. The collar is welded to the end of the header, the finned flange wil cover any remaining visible welding . 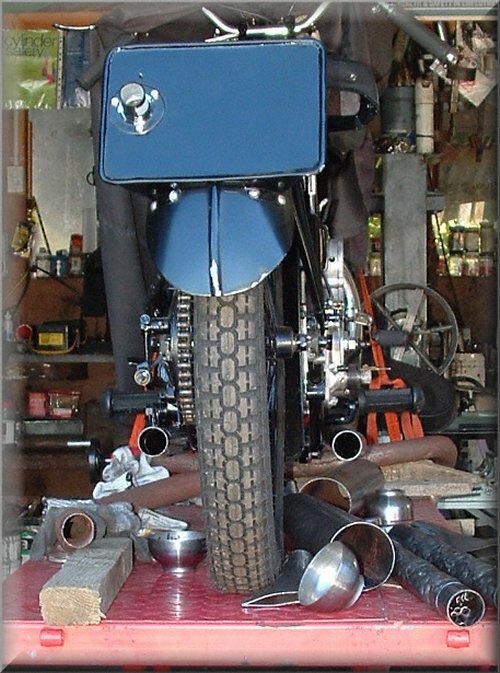 The headers fitted up for comparison. The right hand is drooping. it could be heated and rebent but i'm going to take a shortcut. See the white arrow. That indicates the position of a hacksaw cut to the freshly welded collar that will fix the droopy header. A hacksaw cut will fix it. 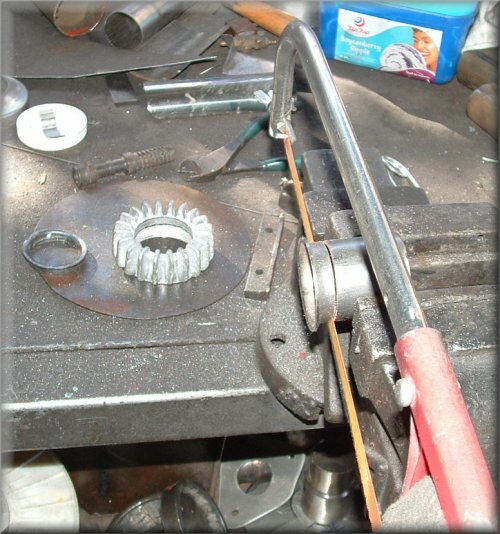 The header is placed in the vice and the collar is cut at the weld 3/4 through at the angle indicated by the arrow. The cut is closed at that point and rewelded which changes the position and angle of the header a few mm at the other end . The slight change in angle at the port end is not noticable. It's hard to do the job without everything there. 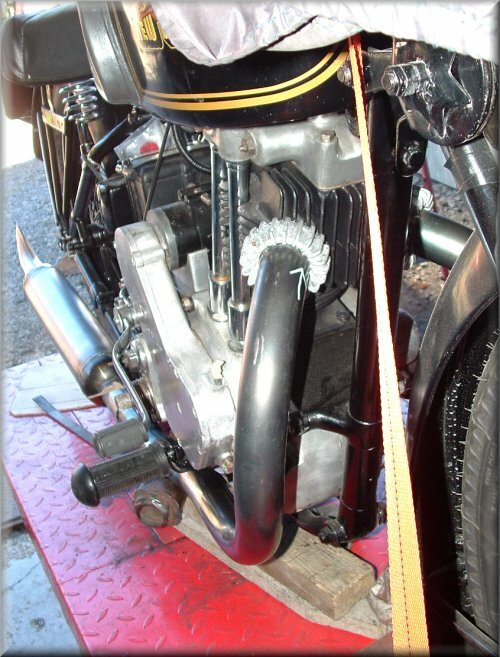 To move the silencers outwards a slither section is cut from the last bend of the RH header to re-angle the end outwards slightly then the ends very carefully matched and welded back together. Once it's smooth sanded and polished it blends perfectly. On the other side the header has been spot heated with oxy/acet and bent outwards slightly. This method can distort the tube surface and should be used sparingly, but in this case it is just a small area out of sight. Here the hangers are in place and its ready to go to the polisher and chromer. End of job for me as in this case the owner is finishing it off . Extra silencer and fishtail left over. The hanger mount was welded in the wrong place for the New Imperial- on the top in stead of on the side. This might suit some one.. for sale as is in raw steel ready for polishing and chroming.